Parqal: Aseana City’s most integrated mixed-use development begins construction – D.M. Wenceslao and Associate Inc.
MANILA, PHILIPPINES – D.M. Wenceslao and Associates Incorporated (DMWAI), developer of Aseana City, takes another step in creating a world-class and progressive community as they formally hold the groundbreaking ceremony of Parqal; the most modern and integrated mixed-use development project in Aseana City. Parqal, a word play from the terms Park and Kalye is a five-hectare development that has a gross floor area (GFA) of 78,000 square meters. It is composed of nine independent four-storey buildings that will occupy two blocks of Macapagal Boulevard – Block 2 (between Celero Drive and Macapagal Boulevard) and Block 5 (between Macapagal Boulevard and Imao Road). The buildings’ architectural expression has a modernized approach in terms of form, character substance, and material profile of the “Bahay-na-Bato” – the Philippines’ vernacular architecture derived from Hispanic and Chinese influences. Seeing the need for more open-spaces in modern urban planning, 60 percent of Parqal’s total lot area is dedicated to lush green landscapes and recreational facilities. “Decades ago, sustainable park living in the city was only a dream for the Filipinos. With the inception of Parqal, this dream is now a reality. Imagine a long retail spine where you can find themed open-spaces every five minute-walk. I think that’s something you can only find in Aseana City”, said Buds Wenceslao- CEO of DMWAI. 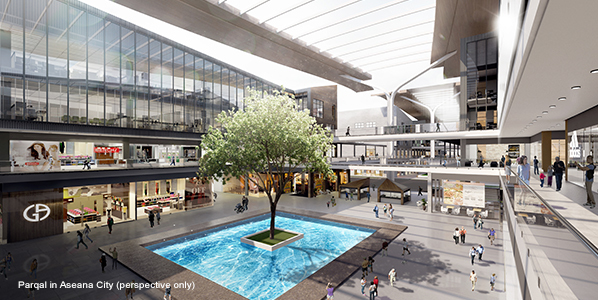 In the future, Parqal is perceived to be one of the top tourist hubs in the metro boasting its impressive architectural design, first-rate retail and commercial outlets, prominent green spaces, and proximity to the airport and other public transportations. Moreover, through this project, DMWAI’s aims to generate more jobs for the Filipinos and establish a community that is sustainable, progressive, and world class. Parqal is slated for completion by end 2021.